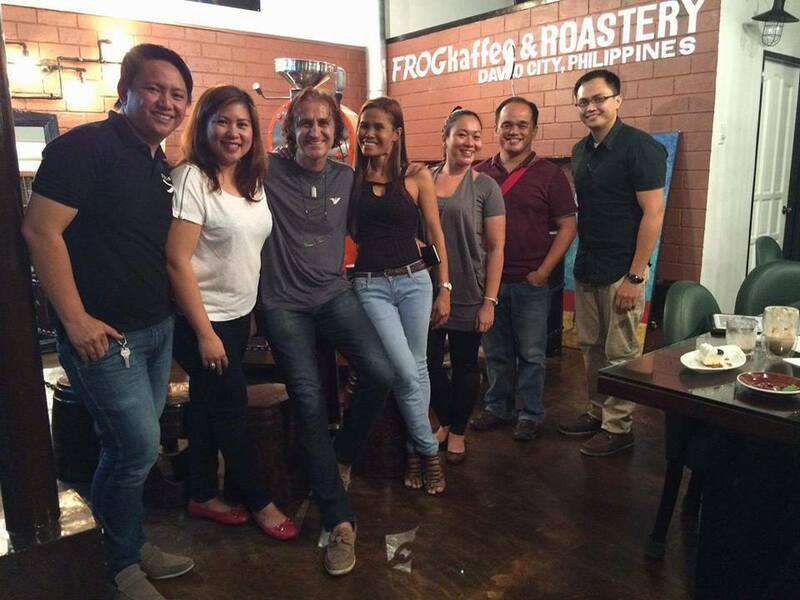 I was invited by Sir Jung Nam Ang, a friend from my SSC FB group to visit his friend coffee shop FROG Kaffee & Roasters located at Prime Square Torres St., fronting Yellow Fin Restaurant. Without hesitation, I said YES. But I am going to invite my other colleagues in Media, Blogging and Vlogging industry. Since the roasting is usually scheduled at Monday night (because they personally roast their coffee beans once a week), we were scheduled to meet the owner at eight in the evening. Upon entering, I'm not sure if I'm in the right place. 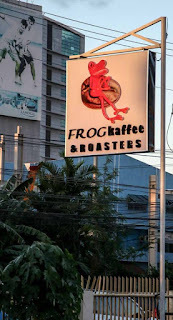 If the owner would even know how to serve a decent coffee or not, or if the unintentional name of the coffee is "FROG" on the sign --- for me is ironic. I love the atmosphere, it is like you are in Italy. 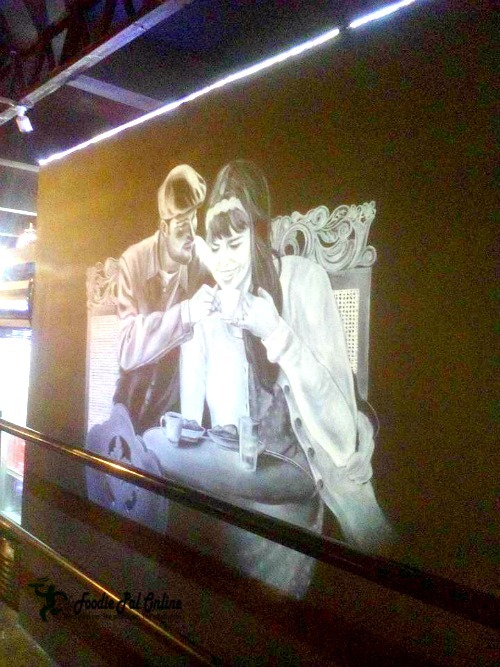 With tons of hand-painted art works on the walls. And I am proud to say that the hand made paintings is made by a Davao Artist named Rey. 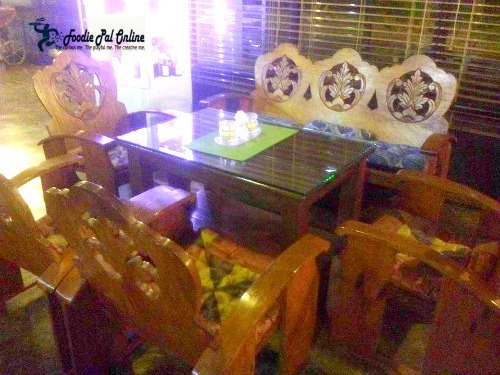 And the furniture's are exquisite Davao products from M. Tanoy Concept and MANA Davao. 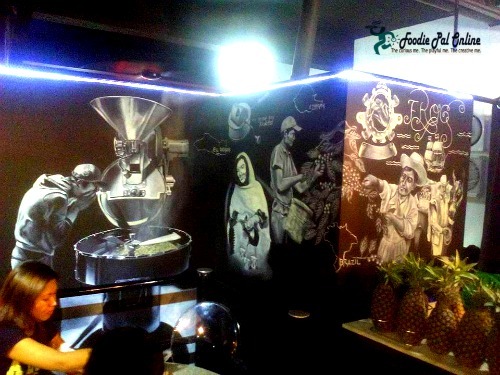 I greatly admire their concepts in promoting their kaffee, this is not just a typical coffee shop, but they called it, the Pioneering THIRD WAVE kaffee shop in Davao City. 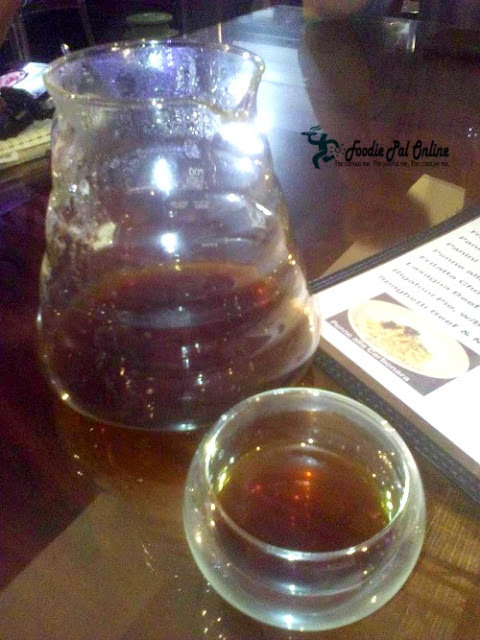 Which means, they treat coffee beans as an artisanal ingredients and seeks to convey the flavor in the brewed coffee. 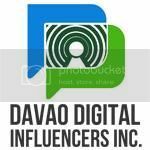 We introduce ourselves to the owner Markus Ableitinger (an Austrian citizen) and Gina Ellorango (a Dabawenya, born and race at Davao Oriental). 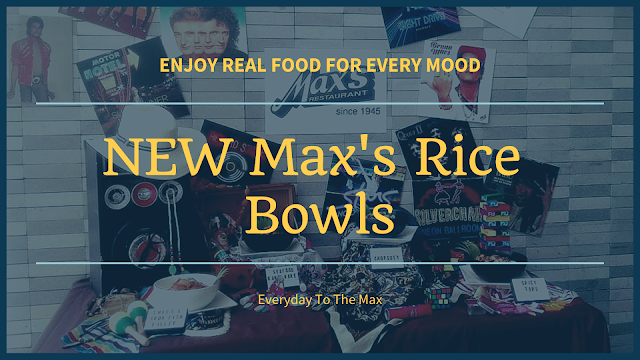 The owners are so friendly and always smiling. They truly love what they do. Apparently that night the in-charge for roasting got sick, instead of having us see how they roast their beans, Markus and Gina welcomed us with coffee drinks and coffee cakes while having a chit-chat with them. A classic method that produces highly balanced flavor. An inventive method which uses gentle force of air pressure, brings out complex flavor. ***Affogato is an Italian word for "to soak or drowned". A coffee-based dessert, scoop of vanilla ice cream topped with a shot of Espresso and Bailey's, this is PHp215/serving. My favorite! 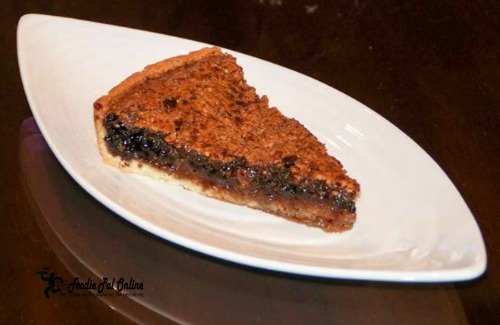 It taste heavenly, a bit of chocolate and espresso in each bite, making it so sweet..yummy...gooey pie. 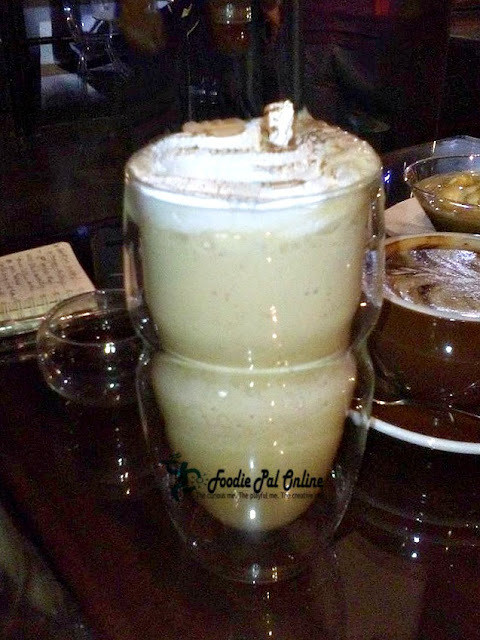 A delicious coffee dessert! Since I don't have a nice shot with my Cocomo Cheesecake, I get this one at their Facebook Page. A delightfully rich coffee blended with cheesecake on a coco biscuit base finished with chocolates chips on the top. 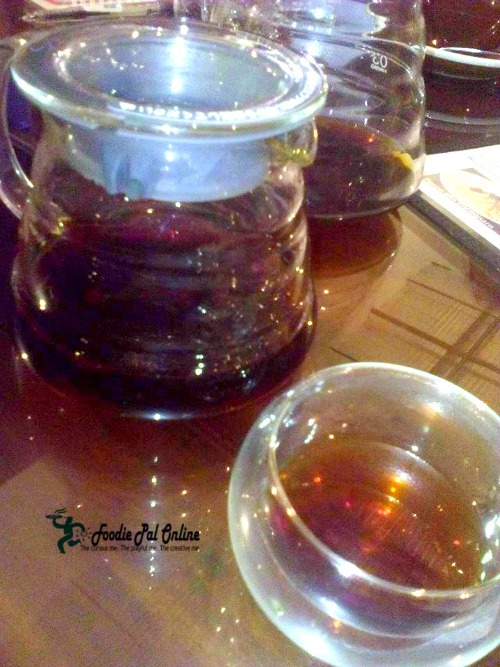 What make this so famous in their Kaffee is that, the smell and the taste is very tempting. The first layer is a kind of a crust, that's sweetened with powder sugar and given body with a Cool Whip, added with the espresso. 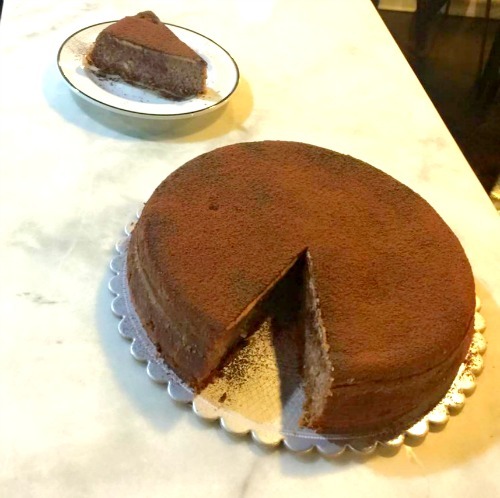 The original Sacher-Torte recipe is a well-keep secret, known only to the confectioners at Hotel Sacher in Vienna. 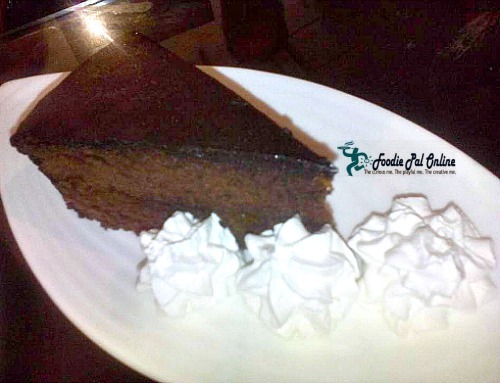 Now, they are many version of Sacher-Torte, but this one is a replica of what does the cake taste and looks like. This cake is good for those who doesn't like sweet cakes. Indeed a good companion for coffee. 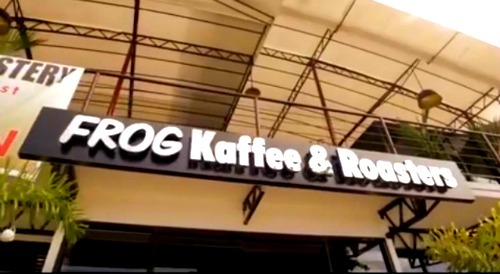 Love to say that this is the best coffee shop that gives pure and fresh coffee experience here in Davao City. 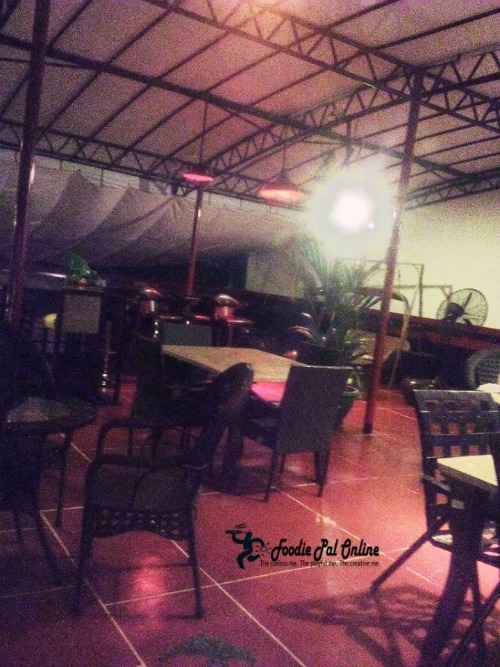 With the fast and free internet that they have, you will surely enjoy your stay here drinking coffee and good place to hang out, study, date, etc... The metropolis down the street is always packed and crowded, but this place is way better. Go here, try this place. The staff is very relaxed and friendly. The coffee is the BEST and it hits the spot without hitting your wallet. 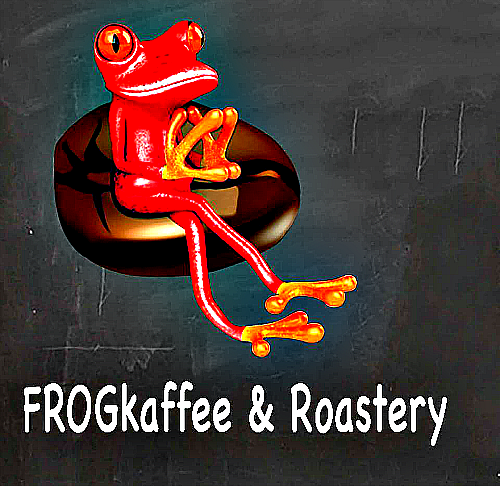 FROG - means Fresh Roast Of Great Coffee. That' s it! 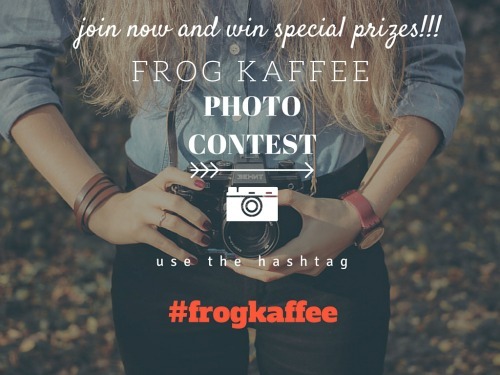 And for those who like to join the contest, you can share your most creative Frog Kaffee photo by sharing it via FACEBOOK and INSTAGRAM using the hashtag #frogkaffee. *The most creative photo will win and get special prizes! **There will be 1 winner for Instagram and 1 winner for Facebook. ***To be announce this January 31, 2016 in the evening. So order early, should have it in 2 to 3 days except Sunday. I loved this post! I write reviews on Zomato about Indian restaurants. Should I start a food review blog? Why not start making a food blog...that will be good George. 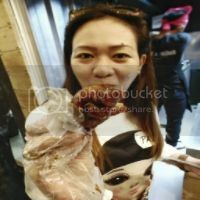 You are not just simply eating but also promoting your food in your country at the same time. Thanks. Wow! 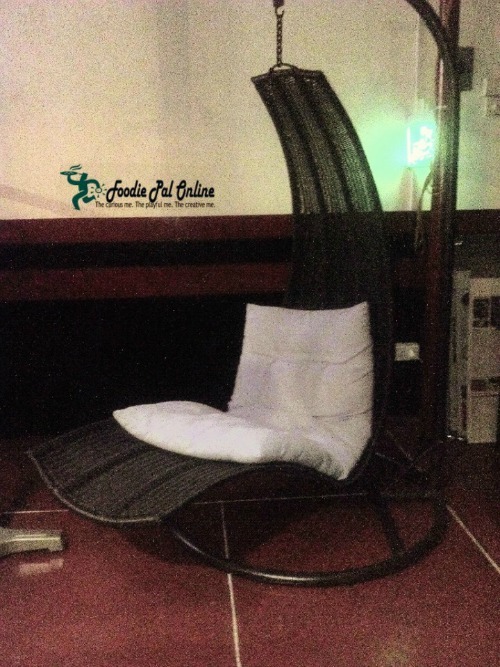 Very nice post with complete information about the "kaafe". I am not a coffee fan but this post makes me drool. Yummy! Great post. I love how unique and creative that place is. I love the pictures you've shared. Looks amazing. Thank you. Keep it up! The place looks great, I love that they have a lot of cakes to pair with your favorite cup of coffee. I've never been there and I would love to give it a try. I've grown to love the different preparations for coffee. This is something I'd love to try though the name of the place is a bit weird. I do not drink coffee so I probably will not go here. But I think my wife and daughter will like those innovative coffee drinks and cakes. Ambience looks nice and the name is so catchy that people will definitely stop and look for it. Lovely concept! I dont drink coffee but I look forward to trying out their cakes. It looks really good! i guess the place is rather dim that's why the photos didn't do the food justice! when i read coffee shop, my first thought was actually a small hawker centre because that's what 'coffeeshop' means to us in Singapore. Espresso-Chocolate Lasagna looks yummy! This is so bad, I hardly crave for desserts like this, this is the first time I feel like having this so much! Whoa! Those desserts, all those cakes and pies look too yummy and its making me hungry right now... Btw, indeed its a quirky name! I will visit this when I came back in Davao. 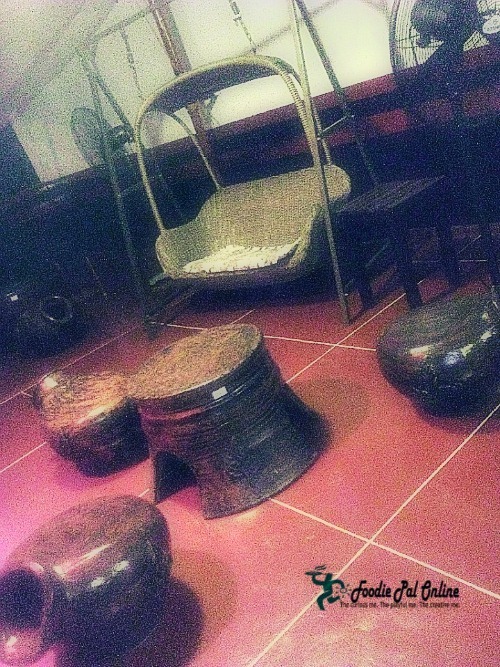 I will tell my friends from davao to visit this café. I am eyeing for that Espresso-Chocolate Lasagna its so tempting. The cafe looks quite cozy and they have good choices of drinks also. I'm not big on coffee so this doesn't seem tempting to me. The chocolate lasagna looks yummy though! I'm cracking up about the name and the logo. I'm however oohing over the cheesecake. I just love cheesecakes! there are a lot of third wave coffee shops in Manila, glad to know one already landed in Davao, i hope that trend catches on. It's also nice to see how well decorated the place is! This place looks amazing! 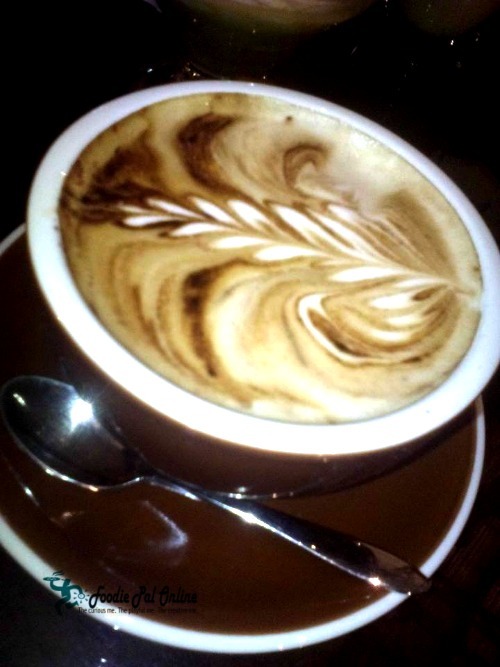 I love a good coffee - and I see they have it all here, from artisan made ones, to "usual" ones. Love the "designs" in coffee as well. And the cakes... Well, now I have to eat something sweet.